A shop(張三瘋冰火菠蘿油專賣) out in Tainan, Taiwan has decided that its not going to part of the boba pack, but rather, its going to blow the rest of the crowd out of the water. 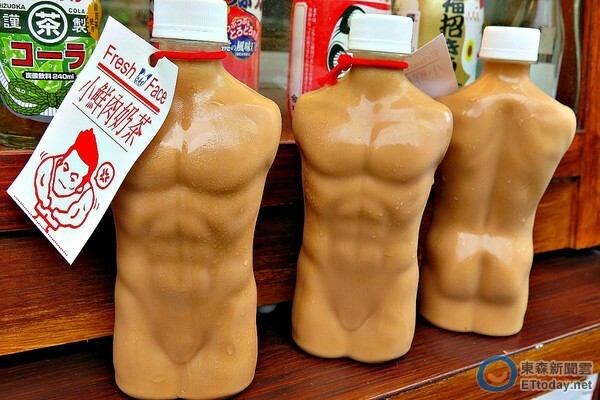 The shop filled up bottle molds with milk tea and calls it 小鮮肉奶茶 – literal google translation is little meat tea, which makes no sense in English so we are just going to call it “hunky milk tea.” These molds are as shapely as the torso of UFC fighters. When milk tea is added into it, suddenly you have a drink that is worthy of female fandom. These milk teas have proven so popular that people are lining up every single day in hopes of buying them. Given that the Taiwanese have a penchant for lining for everything, I guess it shouldn’t be all that surprising. More likely explanation is that these are offered 3 days out of the week starting at noon so supplies are pretty limited. In addition to offering hunky milk teas, these pretty cool fruit juices in IV pouches are also available. Truly these guys have a penchant for giving the public what they want. Not quite sure how this will flesh out when all the other shops in Taiwan start doing the same, but for now, these are badass. 60 NT for a bottle of milk tea. 70 NT for a bag of juice.